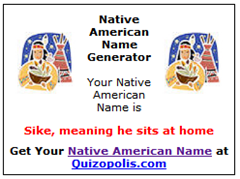 Well since Elizabeth Warren gets to be a self-declared Native American and it's now racist/sexist to question her status I figure we all can be too. So the first task for the Moron Nation is to come up with a more fitting name rather than the one your paleface parents gave you. Here's mine based on this all-scientific-and-stuff computer-based generator. No one seems to listen to you and you always seem to be just a few cents short when you need it most. Luck doesn't seem to be on your side but someday you'll dial a different number. Don't like these? Well then your name must be Yanishka Machakw meaning 'one who is never satisfied and whines like a woman'. Post contains 1223 words, total size 17 kb. So it's an attack on the qualifications of women, or something. But if Elizabeth Warren's career was advanced owing something to this apparently bogus "family lore" about her Cherokee heritage -- well, that's already an issue. It becomes a Big Honking Issue if in fact she's lying about her "Cherokee heritage." We're not biased -- You are! Chiefly, that the media is biased. The guy's argument seems to be that the media, as a whole, has some conservative elements (Fox News, etc.) which "balance" the rest of it so that, as a whole, it's not liberally biased. There are several problems with this. First of all, FoxNews and Rush Limbaugh cannot possibly balance ABC, CBS, NBC, CNN, MSNBC, NPR, The NYT, the LAT, the Washington Post, and all of the big newspaper conglomerates. Further, even if it were the case that a few conservative elements of the media balanced, as a whole, the liberal parts of the media, the liberal parts of the media would themselves still be liberal. Let's say that FoxNews can balance one major news organization's leftwing tilt -- say, CBS'. Okay, fine. CBS tilts left and Fox tilts right and they cancel each other out. But CBS is still liberal, isn't it? The guy simply seems bad at, what's the word, thinking. UPDATE[DiT]: He's also bad at crawfishing. Today the headline reads "How Biased Are the Media Really?" She's now claiming she doesn't know if she told Harvard she was part Indian. Somehow that just ended up in Harvard's bio of her -- but I suppose maybe they thought she just "looked Cherokee" or something. Now she claims she doesnt recall if she played the race card when she applied for her big-wampum $350,000-a-year job at Harvard Law. You see, it was so many moons  I mean years, ago. Sounds like a lot of bull  Sitting Bull. She even said she knew nothing about Harvard Law bragging about her alleged Indian heritage until she read about it in the Herald. More Sitting Bull from the Veritas crowd. Granny knows how this plays out from here. A group of Indians  real Indians  will demand that she release her employment application to Harvard Law, so we can see what box she really checked off under race, as if we dont already have a pretty good idea. Her GOP Senate rival, U.S. Sen. Scott Brown, said today the story raises some questions that need to be answered. Browns campaign went further calling on Warren to apologize for allowing Harvard to claim she was part Native American. David Bernstein of Volokh looks into Warren's claim that she has no idea how Harvard got the idea she was an Indian. The old AALS Directory of Faculty guides are online (through academic libraries) at Hein Online. The directories starting listing minority faculty in an appendix in 1986. Theres Elizabeth Warren, listed as a professor at Texas. I spot-checked three additional directories from when she was a professor at the University of Pennsylvania, including 1995-96, the year Harvard offered her a position. 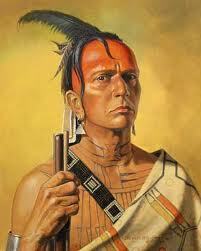 Elizabeth Warren, Elizabeth Warren, Elizabeth Warren. 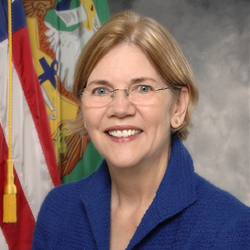 So, we know one thing with almost 100% certainty: Elizabeth Warren identified herself as a minority law professor. We know something else with 90%+ certainty: (at least some) folks at Harvard were almost certainly aware that she identified as a minority law professor, though they may not have known which ethnic group she claimed to be belong to, and it may not have played any role in her hiring. But it gets even more interesting: once Warren joined the Harvard faculty, she dropped off the list of minority law faculty. Now thats passing strange. When the AALS directory form came around before Warren arrived at Harvard, she was proud enough of her Native American ancestry to ask that she be listed among the minority law professors. (Or, in the unlikely even that she just allowed law school administrators to fill out the forms for her without reviewing them, they were aware that she claimed such ancestry, and she didnt object when she was listed.) Once she arrived at Harvard, however, she no longer chose to be listed as a minority law professor. You Know When I Said Nothing Untoward Would Occur In Your Mouth? ...that was just part of my "Family's lore." See, if it it's "family lore," it doesn't have to be true. Post contains 732 words, total size 5 kb. 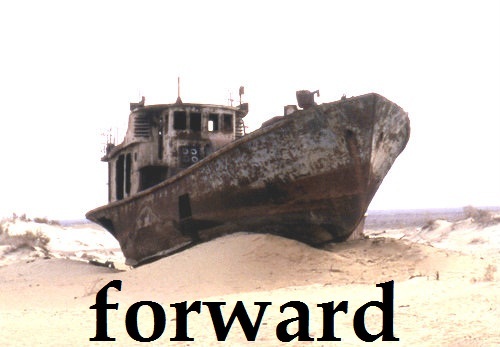 It just so happens that MSNBC crafted its own slogan a year or so back, and that was "Lean Forward." So this is the one-word slogan to replace 2008's "Change." More honest would be "Downward:"
Or maybe Upward, if we're talking debt. A little earlier than scheduled -- because on that day the quarterly GDP growth estimate for the 3rd Quarter. And it appears that the economy is slowing -- and it was already stagnant. Now you may wonder if Obama would permit any sort of 1% or lower reading on the economy, or would demand it be fudged upwards. But that's a silly thing to wonder. Of course he'll demand it be "revised." [A Goldman forecaster] said she agrees with Goldman economist Jan Hatziuss forecast of the second half being more difficult than the first. We have seen some deceleration in economic activity after a mild winter that might have puffed up seasonal growth in the first quarter, she said. Wait, the second half will be more difficult than the first? We might be lucky to have 2% growth in the first half. This may be the best Obama can do. But it's not the best America can do. As Goes California... ...so goes the nation? A lot of people throw the word "unsustainable" around without really appreciating its simple meaning: This will not be sustained. It will end. Wait 'till you hear this. A controversial anti-obesity slush fund under Obamacare was used in Nashville, Tennessee to spay dogs and cats. The reasoning: stray dogs scare people from exercising outdoors. Gee, it sure sounds like people are using government money, appropriated by Congress for specific constitutionally-approved uses, for any damn thing they like. Maybe we should try that "Old System" where dollars were used for the purpose intended, and we didn't appropriate as many of them, so it was easier to keep a handle on whether or not our system of free government was actually operating as required by the Constitution. Another good, sensible tweet at the link, where he proclaims the economy isn't "Democrat or Republican," it's "business and math." Or "profits and earnings ratio," as the Idiot King might say. Well, that's probably not true. I'm sure some conservatives did comment on it. But then, Lovitz didn't hear it. The Two Minute Hate wasn't declared. He attempts to define "liberal" to non-liberals. And I don't mean conservatives. I mean what's typically termed "liberal," now, but is as illiberal as you can be. Liberal, from the word "Liberty"
be it conservative, democrat, republican, libertarian.. There's video of the comments at the link. Previously we heard only the audio. This isn't really news, but it's worth mentioning. I'm going to bold-face some words from this story. Were looking to maximize revenue and maximize the reputation of 1 World Trade Center, Douglas Durst, who is building the Freedom Tower in partnership with the Port Authority, told The Post. The antenna business alone could easily rake in $10 million in revenue, estimates show. Youve got to get people back to thinking of the trade center not as a site of an attack but as a center of commerce, said one person who has been involved with the reconstruction of lower Manhattan. I don't know these people's politics. Given where they live, and their income level, I would put money on them being liberal Democrats. The left frequently speaks as if Commerce Is Theft. And yet here you have people, who I would bet are liberal, speaking of commerce and competition and "maximizing" revenue as if, get this, those are good things. You will often hear Hollywood people demanding tax breaks for local production. Otherwise, they say, they cannot profitably make movies in the US, and will film them in Canada. And then, having pronounced that Taxation Reduces Economic Activity, they will turn around and donate $1 million to Barack Hussein Obama. In their hearts they know these things the left claims -- Commerce Is Theft, Profit Is Evil -- are false. In their daily lives, they know this. But at voting time, they counterfeit their beliefs. They convince themselves that even though they know Profit is Not Evil, good people speak falsehoods, and good people declare things which are false to be true. It's not true-- but good people insist it is. And so they do. Very strange self-deception. And to what end? In what code is falsehood superior to truth? Below, video of the tower, lower levels mostly finished, top levels still needing their skin. Statistically insignificant, but you knew that. But at least that six/seven point lead has evaporated. This seems like a swingy poll to me. I can't imagine any actual motivating factors that might have pushed Obama into a seven point lead a week ago, or then taken that lead away this week. I keep saying I'll ignore the polls. I guess I'm lying. But I guess the take-away here is that seven point swings back and forth aren't any big deal in Gallup's polling. 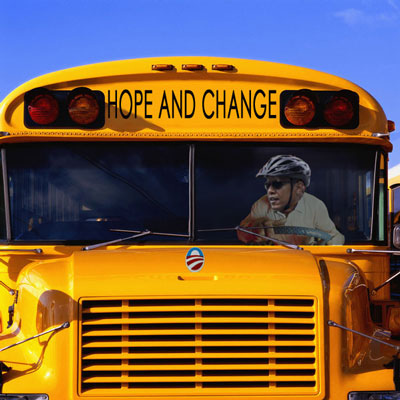 The wheels of Obama's campaign bus easily handle human obstacles. It was kind of like how the Romans used to, you know, conquer villages in the Mediterranean. Theyd go in to a little Turkish town somewhere, theyd find the first five guys they saw and theyd crucify them. If the EPA are the Romans, and the oil companies are the crucified prisoners, would that make BP -- Obama donor corporation which flooded the Gulf with oil but suffered no specific-to-them-consequences-- Barnabas? Unemployed young people can't move out of their parents' houses with Hope and Change credit cards. In 2008, Obama had a 34-point advantage over Republican Sen. John McCain among voters younger than 30. He won about two-thirds of the vote in that age group. But a new Harvard poll suggests the president could face a more difficult sales job with younger voters this time around. Obama led Romney by 12 points among those ages 18-24, according to the survey. Among those in the 25-29 age group, Obama held a 23-point advantage. 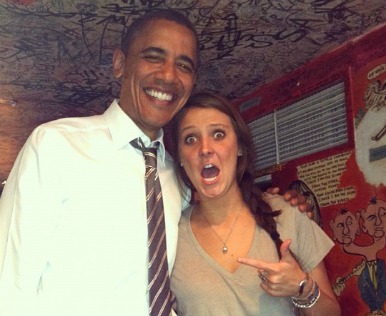 The picture above is of a Colorado University student who got a funny picture snapped with the president on one of his seventeen bazillion political trips. She says Obama is a "wonderful dude." But when asked by optimistic Obama-boosters on CNN if she'll be voting for him, she says "Um" and claims she has some principle against saying who she'll be voting for on TV. Which means, in all likelihood, she's not voting for him. The anchorettes pretend they're happy to hear she won't reveal her voting preference, but I can't help think they're butthurt that the girl spoiled their Obama-loving party. Spectacular visuals. The CGI here looks real and not over-used. I've got a good solution: BMW can pay him off, but on the condition he appears in ads. "BMW gave me a two year erection!" Writes itself. Okay, leave that last part out of the ad. *Not mentioned in headline: Obama sees a 16 point drop in support from 2008 share (77%). President Obama currently grabs a significantly smaller share than Kerry (74%) or Gore (79%) as well. But I guess that headline would be uncomfortable. In case you missed it over the weekend, the Friday night document drop was a notice from the Obama Administration that it is sending the Palestinian Authority $192 million in aid, contrary to a Congressional ban. WTC 1, the Freedom Tower, which will surpass 1,250 feet today, will taunt the Empire State Building (height: 1,250 feet) by lighting a blue and white color scheme this evening. Those colors were chosen to mock the Empire State Buildings controversial 2010 decision not to light the building in honor of the 100th anniversary of Mother Teresas birth. Didn't see that coming. 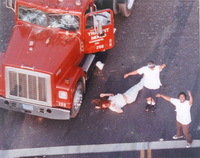 It was 20 years ago on April 29, 1992 that the Los Angeles riots began. At the time I was living just a few miles north of the epicenter and the riots forever colored my views on social unrest. Since then I have almost no tolerance for it and I've sworn to never be unarmed again. "I was just helping a person who was in need"
The quote in the title of this piece is from Bobby Green, one of four black people who were heroes in the LA riots of twenty years ago. But there's no "just" about it; the acts were rays of hope in an otherwise bleak picture. ...Murphy saw that Denny had managed to drag himself back into the cab of the truck, which was moving very slowly. Murphy ran to the passenger side and jumped on the running board; he saw a woman named Lei Yuille comforting Denny inside the cab. Just then, a hulking guy named Bobby Green leaped on the running board of the other side. The two stared at each other through the windows, each fearing the other was a rioter. ...Green jumped in and drove the massive truck a terrifying three miles to the hospital, with Murphy's girlfriend Barnett guiding the way by driving in the car in front. Murphy clung to the outside of the truck for the entire journey, feigning to be a rioter by pounding on the outside of the vehicle as if he had taken it for loot. From his position on the running board, Murphy was also able to guide Green, who couldn't see through the truck's cracked windows. "Each one of us could not carry on the task without the other," says Murphy. "Bobby couldn't drive the truck without me on the outside. Mr. Denny was attended to from the inside [by Yuille], and we couldn't drive the truck without Terry in the front of us." The result was a perfect collaboration. "We all came together as a team," he says. "It was like it was meant to be." Post contains 994 words, total size 10 kb. A white flag of surrender to the 42nd Infantry Division, United States 7th Army, over Himmler's self-described "first concentration camp for political prisoners." Later fitted with gas chambers and ovens. As we moved down along the west side of the concentration camp and approached the southwest corner, three people approached down the road under a flag of truce. We met these people about 75 yards north of the southwest entrance to the camp. These three people were a Swiss Red Cross representative and two SS troopers who said they were the camp commander and assistant camp commander and that they had come into the camp on the night of the 28th to take over from the regular camp personnel for the purpose of turning the camp over to the advancing Americans. 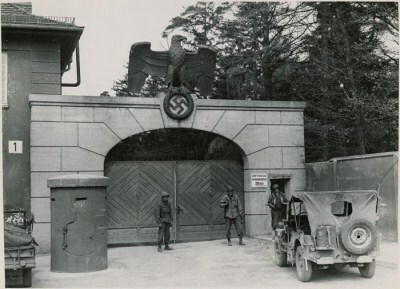 The Swiss Red Cross representative acted as interpreter and stated that there were about 100 SS guards in the camp who had their arms stacked except for the people in the tower. He said he had given instructions that there would be no shots fired and it would take about 50 men to relieve the guards, as there were 42,000 half-crazed prisoners of war in the camp, many of them typhus infected. He asked if I were an officer of the American army, to which I replied, "Yes, I am Assistant Division Commander of the 42nd Division and will accept the surrender of the camp in the name of the Rainbow Division for the American army. Liberated on this day, 67 years ago. After 31,000 people were murdered there. Which makes me pretty unconcerned about the reports of 7th Army soldiers executing prison guards. I mean, I'd like to be polite and sorta care, except I'm not going to. SERVERS FOR MORONS! I've never been a Server Admin or have clue one on running a TF2 server (or L4D2). So i'm putting up the Ewok signal for anyone that has close ties into a gaming community. See if they'll let us borrow one of their servers for a night. Talk to your bros. Or if you are a Server Admin yourself, let me know! I would love to have a Moron Night on a good 32 man TF2 Payload map, PLR, or whatever! Good clean fun. With cursing! And Gibs! I don't want to embed above the fold, so This makes me miss Competitive TF2 Play so much. It's such a blast. Coordinated Uber pushes roar! Post contains 1620 words, total size 10 kb. 117kb generated in CPU 0.19, elapsed 2.2343 seconds. 44 queries taking 2.1695 seconds, 281 records returned.